During the latter stages of project completion on a Laing Homes site in Blackheath, the Client noticed that Japanese Knotweed had infested the site. Extensive knotweed stands were present on the adjacent property and these stands had crossed the boundary of the site through the foundations of the boundary wall. Unfortunately, a previous groundworks contractor had inadvertently spread knotweed contaminated soils across the surface of the site. The remedial works carried out by VertaseFLI involved the excavation and disposal of knotweed infected soils from beneath the boundary wall and adjacent areas. 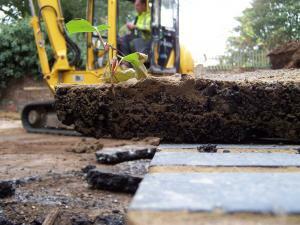 In total some 100m3 of knotweed infected soils were removed. Underpinning of the boundary wall was required to ensure its long term stability. Following completion of the site works return visits throughout the growing season were made to confirm the complete eradication of the knotweed.